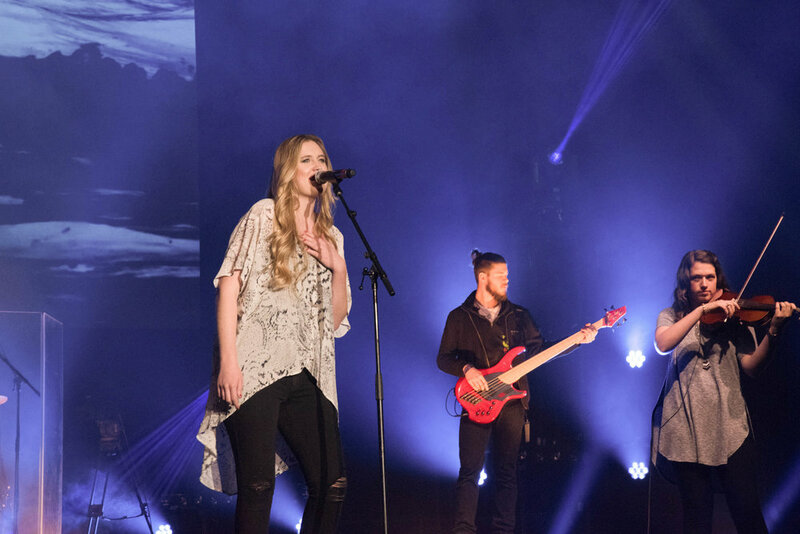 "Alyssa Newton developed a passion for worship music at a young age. Her first performance was at a church retreat in fourth grade, where she sang “Praise You in This Storm” by Casting Crowns. With her original worship music and leadership style, she hopes to lead others into a safe space to feel freedom and joy in the presence of the Lord." "Estef is an LA based artist with a love for soul and would love to bring this to the table as it is the basis of all good pop music. She loves to dance and make people move and hopes to bring this to showcase this year!" "Consisting of Charlie Greene, Ben Booth, Taylor Dubray, and Chase Wofford - Wilder combines the lyrical and vocal styles of Americana/Folk with an instrumental style that can be best described as groovy alternative rock. Influenced by artists such as Kings of Leon, Coldplay, and Mumford & Sons, the band puts an emphasis on their songwriting and exciting live shows. Wilder is in the process of recording their upcoming EP and strives to create songs that can truly impact people as well as put on shows that always leave people wanting more." "Born and raised in the small town of West Middlesex, Pennsylvania, Kenzie Palmer was blessed to fall in love with music at a very young age. Although her influences range from classic rock, Motown, and country, she is a country/pop artist. Kenzie attended a performing arts high school in Midland, Pennsylvania. After graduation, Kenzie realized her true calling was in country music. She discovered Belmont and knew it was a perfect match. Last year, she performed in the Commercial Music Showcase as a solo artist. Since then, she has been working on honing her writing skills, and has recorded and released a handful of singles. Kenzie has performed at numerous events for the Pittsburgh Penguins, Steelers, and Nashville Predators. She was also a finalist on the hit show American Idol. In the past few months, Kenzie has performed at writer’s rounds at the Listening Room Café and the Renaissance Hotel." "I am a country singer-songwriter from New Jersey. I have been cutting my teeth in Nashville for the past two years and making important connections within the music industry. Through this time, I have created a niche of songwriters, which has lead to an improvement of songwriting and success. This success includes a cut on Kane Brown's upcoming album (Pull It Off)." "Anna Vaus is a singer/songwriter who draws from her roots. "I'm guilty-as-charged when it comes to writing songs about my hometown," Vaus says, "so many different stories and emotions come from this microcosm of where I grew up. I find a dark humor in a lot of them. All of my songs tend to be a little bit true, and a little bit twisted." But being deeply planted in her roots hasn't stopped her from finding wings in Nashville. In 2016, Vaus was chosen by Miranda Lambert as the first recipient of the Miranda Lambert Women Creators Fund, awarding a female singer/songwriter forty-thousand dollars to attend Belmont University. She's opened for artists like Hunter Hayes, and played venues like The Bluebird Café. But no matter where she plays or who it's with, for Vaus, it's about the song." "Jordan Xidas realized music was his calling in a carseat, singing along to the radio. Following the footsteps of his father, Jordan began playing guitar and writing songs at the age of seven. His music reflected his early influences, ranging from artists like John Mayer to the Backstreet Boys. Currently a student at Belmont University in Nashville, TN, Jordan’s blend of “real emotion and catchy pop melodies” is evident in his songwriting and artistry. With fierce determination, Jordan continues to chase his childhood dream of becoming a professional artist and songwriter." "Inspired by classic songwriters like Don Henley and Paul McCartney, along with more recent artists like John Mayer and Bruno Mars, Brad Blackburn has been developing his own style of writing and performing since he was 12 years old. He started playing out at bars, restaurants, weddings, and parties at the age of 14 and continued to do so throughout high school, entertaining the weekend (and week) crowds with hours of cover & original material. Now a senior at Belmont University, Brad frequently plays around Nashville at venues like the Bluebird Café and Listening Room Café. Some more notable performances include CMA Fest, Belmont’s Best of the Best Showcase (2 years in a row), the 18th Annual Grammy Block Party, and the Live Wholly Festival. He has won a total of 6 songwriting contests since relocating from San Antonio to Nashville. In fact, his songwriting ability earned him the ASCAP Songwriting Scholarship Award in 2015, and $10,000 for winning the Wholly Guacamole LiveWhollyTour in 2016. Moving forward, Brad plans to tour, record, and nurture his love for the studio and the stage. He is currently recording his new album, BLACK&WHITE, due December 2016. Singles, “Good Go Bad” and “Burns Good”, are available now on iTunes and Spotify."